← Are Only a Few Stocks Really Leading Us Higher? China unveils tariffs after U.S. pressure. China’s Finance Ministry announced today that it plans to impose tariffs as high as 25% on $60 billion in U.S. goods. The planned tariffs are in response to President Trump’s announcement Wednesday that the U.S. is considering increasing already-proposed tariffs to 25% (from 10%) on $200 billion in Chinese imports. Today’s news is another development in the back-and-forth of global trade talks, which have dominated headlines this year and unsettled investors. 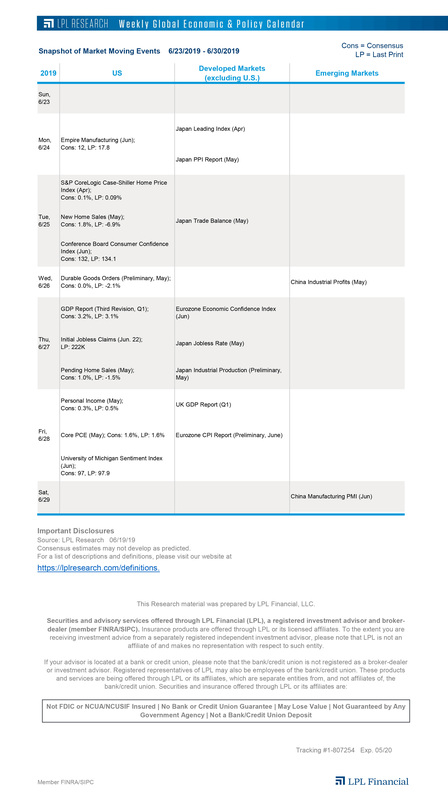 While we believe China and the U.S. will eventually reach an agreement on trade, these trade-related headlines could cause periodic volatility in equities. Job growth cools, but labor market improvement is steady. Non-farm payrolls rose 157k in July, below consensus estimates for a 193k increase. However, previously reported figures for both May and June were revised upwards by a combined 59k to 268k and 248k, respectively, making those the strongest two months for payroll growth since July 2016. Given those revisions, cooler growth in July makes sense, and the long-term trend of payroll growth looks steady. The unemployment rate dropped to 3.9% last month after unexpectedly ticking up to 4.0% in June, while wage growth was tepid as average hourly earnings grew 2.7% year over year, in line with consensus expectations. Overall, today’s report confirms the labor market is still gradually tightening, but the persistent lack of wage growth won’t force the Federal Reserve to speed up its plan for interest-rate increases. Opportunities abound during stocks’ weakest month. While August has historically been the worst month for the S&P 500 Index, on average, seasonal analysis can help you uncover potential investment opportunities to benefit your portfolio during this seasonally fragile time period. Today on the LPL Research blog, we investigate which S&P 500 sectors and industry groups could outperform broad equities during the month.